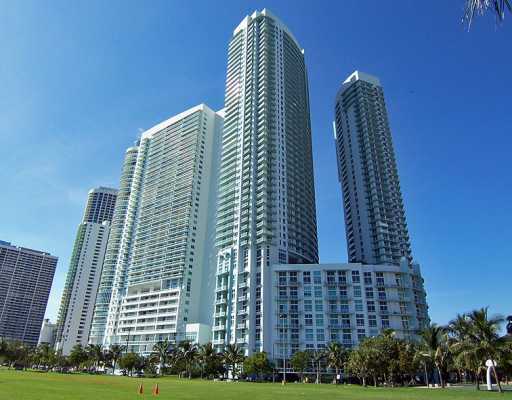 Miami's Bayshore Drive is home to several condominiums and among them is Quantum on the Bay, a pair of buildings standing 51 and 44 stories. You'll find a total of 698 units available as studios or with three bedrooms as well as penthouses. Because Bayshore Drive is in an easternmost location, the views of Biscayne Bay and Miami Beach are unobstructed, but even the vistas in the opposite direction of Miami's city skyline make for a truly impressive place to call home. Swimming pools, exercise facility replete with modern equipment for every muscle group, it's all at Quantum on the Bay and its northern and southern towers. The units have 594 to 2,255 square feet and boast plenty of upscale features including floor to ceiling windows, modern kitchens with European cabinetry, marble bathroom countertops and much more. Ceiling heights vary between 9.4 feet in tower residences to eleven and thirteen feet in penthouses and lofts, respectively. Across the street from Quantum on the Bay is Margaret Pace Park, a commons that overlooks Biscayne Bay. Head south of Quantum on the Bay and you'll eventually be within the downtown area of Miami where there are museums, al fresco shopping, the American Airlines Arena and much more to explore. You can see Miami Beach from your Quantum on the Bay condo home but reaching it is just a matter of using either the Julia Tuttle Causeway or the MacArthur Causeway located north and south of Quantum on the Bay.